Occult injuries are subtle injuries that are likely to be missed or mis-diagnosed. Occult injuries are more common in infants and children because ossification is variable and incomplete and because children are difficult to examine. The child with a limp or a minor injury may have a nonlocalizing physical examination and negative radiographs. If a bone scan or MRI is performed, many subtle injuries will be detected. Are the costs and risks of the procedure worth making an exact diagnosis? Will this diagnosis change management? If the evaluation is for determining possible nonaccidental trauma, the answer to these questions is yes. For other problems, the answer is less clear and the decision is based on the situation. Nonaccidental trauma may be difficult to diagnose. This is the most serious occult injury. Toddlers’ fractures include a variety of subtle fractures in infants and young children. They may involve the calcaneus, tibia, cuboid, fibula, or metatarsals. The diagnosis is suspected by finding localized tenderness. Sometimes the radiograph is abnormal and diagnosis is established by a bone scan. Cartilage injuries are difficult to diagnose. They may first become evident by a loose body within the joint. Physeal injuries often pose difficulties in diagnosis, as they are poorly imaged by radiographs. SH-1 fractures before ossification are often missed. Other examples of such fractures include those of the lateral clavicle and medial humeral epicondyle. Physeal stress fractures Stress fractures of the physis are usually due to athletic injuries or neuromuscular disorders such as myelodysplasia. Physeal injuries of the proximal tibial epiphysis may occur with minimal trauma, immobilization, or inflammation. This physis is very vulnerable. The reason for the vulnerability is unknown. Physeal injury associated with diaphyseal fracture is not uncommon. The physeal component is often overlooked, as attention is directed to the diaphyseal fracture. Undisplaced physeal fractures may be difficult to diagnose. Suspect the injury if tenderness is localized to the physis even when radiographs are negative. Stress fractures are sometimes incorrectly diagnosed as something else. For example, a stress fracture of the femoral neck might be diagnosed as a groin pull. These fractures include a large cartilagenous component and little bone. 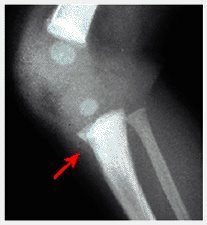 The bony fragment may be difficult to image or see on radiographs. Classic examples include fractures of the lateral humeral condylar and tibial spine.